Last March 9, 2013, GDG Philippines organized the first-ever DevFestW Philippines in Globe Corporate Showroom, Valero Telepark, Makati City. More than the really cute and delicious cupcakes and line of Google product tarps, the event was filled with excitement and inspiration as our speakers share their experiences about the industry and their respective expertise. Registration opened at around 8AM with the men GDG Managers manning the booth and giving away our morning snack. As the hall is filled-up with around 100 women and 20 men, the participants became excited about the contest of taking the most picture for the Google+ events page. The event started with a welcome video message from Stephanie Liu and Adriana Cerundulo explaining what DevFestW aims to achieve. This was followed by a welcome from GDG Bacolod's community manager Anne Olvido. Minette Navarette gave an inspiring talk about the start-up scene in the Philippines and how the participants could participate and be a part of it. This was followed by a talk from Deng Ching-Mallete about her journey as a female developer contributing in OpenSource projects. Combining the start-up talk from Minette and developer experiences of Deng, Ria Lu shared her insights on how she manages her very own start-up company. Ria Lu, President/CEO at Komikasi Games and Entertainment, Inc.
Before going for lunch, Globe Labs Developer Relation Manager, Anne Michelle Santos thanked the participants and organizers for being part of the event and introduced the app demo of LooLoo. Just in time for lunch, our photo booth arrived wherein the participants had a great time using the Google props! The afternoon sessions were divided into two: the non-technical track and technical track. It was a knowledge sharing session between the speakers and participants as they actively ask question about the topics being presented. After the first two afternoon sessions, participants and speakers enjoyed the cupcakes! Before ending the event, we announced the winner of our event contest! The prizes were 5 8GB Android USB for the 2nd to 6th place winners, who will post most pictures in the Google+ Events page and for the 1st place winner it's the big Android plushie. By the end of the event, everyone got a DevFestW shirt and one Android plushie. For more pictures please visit our Google+ Events Page. Thank you so much to all our participants, organizers, speakers, and sponsors for making this a successful event! 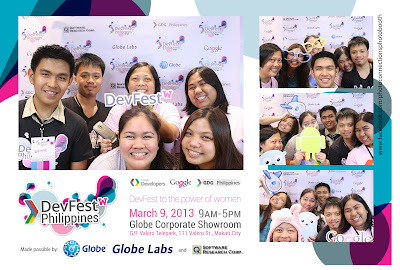 This is just the beginning of what GDG Philippines has planned for the rest of the year, not only for women but for all the developers out there. See you in our next event! *All image in this blog is taken by our official event photographer Lightpipe Photography.